Braden ran his first half marathon in June in the high altitude of Colorado with an excellent finishing time of 1:39, and after the race we checked to see what the world record time was for 9-yr-olds and found out it was a time of 1:35. From that point, he wanted to try to break the record at the CASA Half Marathon in December, and in order to get to there, we started training for it earlier this month. Most of our training runs have been of the short variety and we had signed up for the Soaring Wings Half Marathon later this month, so we started ramping up the mileage. 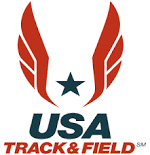 We utilize Little Rock Air Force Base for all our long training runs due to the hilly terrain and hardly any vehicles on early weekend mornings. I thought he might have a tough time with our first long run, but the weather was cool and he had no issues (unlike myself with the hills) running more than 12 miles at a pretty decent pace without stopping. After our run, we had one open weekend before Soaring Wings and I was going to utilize it for another training run at the base. I then found out that there was a half marathon race in Little Rock I could sign us up for that would serve to not only utilize as another train-up event, but would also allow us to run two half marathons within 16 days and become Half Marathon Half Fanatics. The Race 13.1 Little Rock is an out and back course that goes over the Clinton Library bridge and along the River Trail. It is mostly a flat course, but it does have some steep little hills in spots and because of the weather we had, those little hills seemed like mountains! The weather has been really off and on with the cool temperatures and unfortunately, for this race, the humidity was not indicative of fall in October! Braden wanted to run a 1:45 time, but I knew how he performs in heat/humidity and I thought he was very ambitious with his goal. I told him that he needed to hit every water stop to make sure he kept hydrated. He started out pretty strong, but as things settle in, his pace got worse with each successive mile. During the first six miles, he was way ahead of me, but wasn’t really pulling away. At the turnaround point, the humidity finally got to me and I had to start walking. Little did I know, Braden was in the same boat as me and he started having to walk after nearing eight miles. Having to combat the humidity, my legs felt like lead and I was having a lot more difficult time than the kid. I was hoping he was having a better time of it, but he said the little hills and weather were taking a toll on him as well. Knowing my race was not going well, I was just looking to survive and get it over with. As I crossed over the bridge towards the finish line, Braden was there help me get to the finish where he proceeded to tell me how tough of a race he had. Overall, his time was 2:04:11 (a 9:28 per mile pace) and he came in second in his 1-19 age group. For me, it was my one of my worst half marathons as I clocked in at 2:15:59 (a 10:22 per mile pace). I thought that after the tough run we had, Braden would have had a rough go of it recovery-wise, but he actually felt fine even though he was a little disappointed with his time. I told him that I was happy with the way he gutted it out and that a lot of people had issues with the humidity and their times suffered as well. A little bit of good with the bad…we knocked out the first hurdle to become Half Fanatics, but we also found out that his goal to break a world record became a lot more difficult. Apparently in early September, a kid from Iowa knocked five minutes off the record with a time of 1:30 (a 6:55 pace). I told him we’ll continue to race and train for CASA, but even if he doesn’t get close enough to the record, at least we’ll try to get better. Braden’s next race is the Grand Prix’s Breakaway 10K, which will be his first 10K race since May. He’s got the distance down fine, now we’re just hoping the temperatures are cooler (without the humidity) and his times will start dropping! 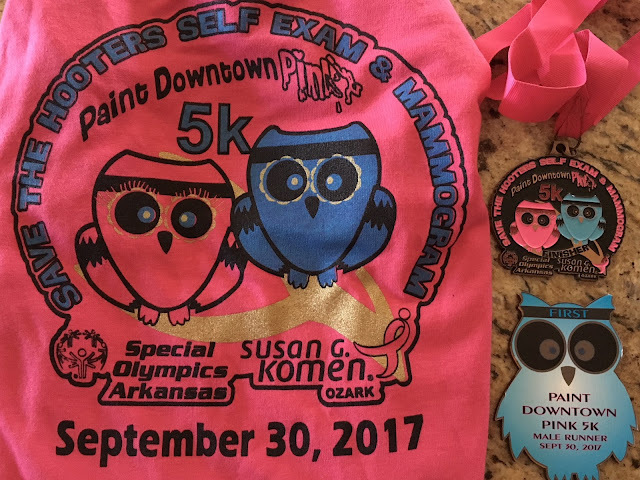 Race #16 on the Grand Prix schedule was on the schedule as Braden and I ran the Paint Downtown Pink 5K in Fort Smith on September 30. We had a very early start to the morning for the tiresome two-hour drive to Fort Smith, but the nice thing was that the temperatures and race conditions were great. Because of the cooler conditions and a decent course, I was expecting us to have some better times than our previous races, but in the same respect, the hotter temperatures during the latter weeks of September kept us from really training at an acceptable level. From Braden’s past history, he runs strong in the spring, where he coincidentally gets most of his PRs, then he spends the fall trying to get back to the quick times he had lost over the summer. His PR for the 5K was set in March with a time of 21:59 and all his recent runs have been in the high 23 to high 24 minute range. This also affects his age-graded percentages where his 70%+ norms drop into the mid to high 60% range during the summer. At the beginning of the race, Braden took off and started to open up a big gap between the both of us, while also keeping ahead of some kids that were older. I took this as a good sign that the weather was definitely in his favor to perform well. At the end of the first mile, his time as 7:07, which was on pace to break his PR. That’s when it fell apart. He was going pretty strong through mile two, but then I started to notice him getting passed by the kids he had been leading and I also saw (from a distance) him clutching his side. I started to actually draw closer to him as well, which is definitely a sure sign of trouble and his second mile average pace of 8:10 was reflective of the issues he was having. Braden’s third mile was not much better than the second as he continued to have a tough time. With about a half-mile to go, he started to pick up the pace again and sprinted towards the finish. His third mile average pace was 7:51 and the last tenth at a 6:14 pace. When it was all said and done, Braden came in with a time of 23:55 (a 7:42 minute per mile pace) and an age-graded percentage of 68.01%. I wasn’t any better, lagging with a time of 24:38. Knowing our training hasn’t been up to snuff, it is still perplexing that a few weeks earlier he ran a better time at the Minuteman Cross Country race on the grass. After the race, we talked about ramping up our training so we could get back to where we need to be, while also knowing the break in temperatures will assist as well. Overall, Braden came first in his age group along with his papa Bernie. This was a non-championship Grand Prix race and since both of them have already maxed out their point totals at 250 and won their respective age groups, they are running out the string for the rest of the schedule. I came in sixth in my age group and was able to pick up 12 points and move into 10th place in my age group in my shortened Grand Prix season. 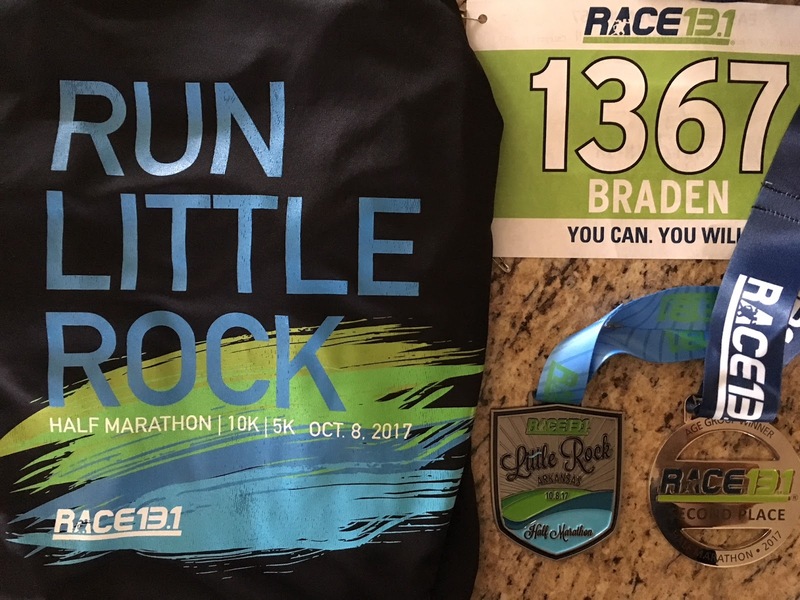 Our next race will be the Race 13.1 Little Rock half marathon on October 8, which will also be Braden's second half marathon. It wasn’t originally on our schedule, but it turns out this will help in accomplishing some achievements we weren't planning on!